Pet owners can be almost as passionate about vacuum cleaners as about their pets. Exaggeration? Not really. Unless you’ve trained your dog or cat to shed neatly into a trashcan, you’re going to be faced with hair and dander all over your home. Since we love our pets, we have learned to love a good vacuum. In this article, we’ll look at the best vacuums for pet owners and narrow down the choices for you. What makes a good pet vacuum? Nearly all manufacturers have come out with models that are designated specifically for owners of pets. What lies behind the catchy names are some common features that we’ll evaluate in our reviews. 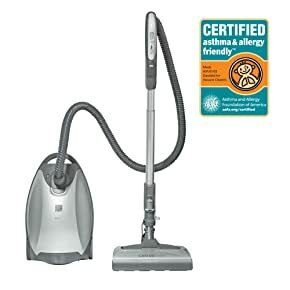 Suction – To really pick up hair, kibble, stray cat litter and other pet-related debris, pet vacuums have powerful suction. This can be somewhat subjective, but we’ll look at overall horsepower and reviewer opinions to see which models can really handle shedding season. Tangle reduction – A common problem with vacuums that use a rotating beater style brush is that they can get hair or other long items wrapped around the brush as it turns and works. If you’ve owned a vacuum, you’ve probably encountered this issue, and have had to reach for the scissors to cut the brush free. We’ll talk about the models least prone to this issue. Filtration – For those with allergies, or simply pets who like to bring a bit of the fragrant outdoors back inside with them, filtration is an important feature to consider. We’ll talk about the type and effectiveness of filters in our reviews. Capacity – If you have long-haired pets or simply a larger space, the capacity of the dustbin is important: it’s where the dirt and hair go before being emptied into the trash. We’ll examine the variations in size and let you know which ones are better for your lifestyle. Along the way, we’ll also look at other features, like cord length, attachments and extra features such as mopping and programming. Ready? Hide the pets, we’re about to turn these machines on! When you’ve put off house cleaning and guests are coming over, this is the model to reach for. This is a canister vacuum system – the main cleaning unit rolls along behind the power head. It’s literally the one to grab when you’re doing some quick clean-ups – the handle is located on top of the compact unit (9 by 17-1/2 by 11-1/3 inches), and the whole machine weighs just 9 pounds. You’ll be able to work quickly throughout your home and address all kinds of clean-up issues as you spot them. The two extension wands can be snapped on to reach cobwebs and dirt in far corners. There are also extra tools that are included as part of the “pet package”. The small beater brush attachment can be used for stairs and upholstered furniture for a deeper clean, and the crevice tool allows the suction to be targeted into small areas for maximum pick-up. There’s also an angled soft brush for walls and other surfaces. The primary floor unit does not have a beater brush, and thus avoids the hair tangling issue. It works well for lower pile rugs and bare floors but may not have adequate cleaning power for deeper carpets. The 12 amp motor gets fine reviews for its general suction – which can also be adjusted. The Mighty Mite uses disposable paper bags and features HEPA filtration to reduce odors as you clean. The bags are nearly the size of the canister, so actually hold quite a bit, considering the smaller size of this vacuum. The lightness of the unit allows for easy use up or downstairs. The 20-foot cord gives you reasonable reach from the nearest outlet. Reviewers really liked the portability of this machine. When you’re done cleaning up, the tools are stored on the canister, the cord wraps up, and you’re able to stow it away and welcome your guests! Not suitable for heavier pile carpets, due to the lack of a rolling element on the cleaning head. Some reviewers have noted that the wand extensions are joined by sliding them together, and can sometimes slip apart. With a bag, you’ll need to remind yourself to check when it’s time to empty. When you’ve decided you need the special functions of a pet vacuum, but still want to mind the budget, the Dirt Devil Razor Pet delivers some nice features, while keeping the price tag under $90. Multiple reviewers mentioned this model’s great ability to handle long pet hair on carpet. This is a canister style vacuum with an extra large dirt cup, emptied by detaching it from the top of the unit. 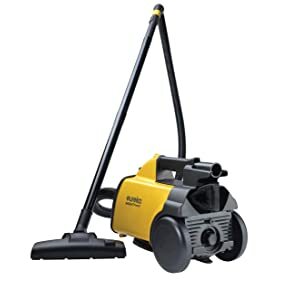 Generally, it is light, maneuverable, and reviewers rated its suction as very good, even with a full load of hair and dust. The attachments are the real bonus here. Not only is there a 10-foot extension wand, there are some pet-specific accessories that are really useful. A 2-way crevice and dusting tool, a powered stair and upholstery tool, and the “Turbo Claw” pet tool are all designed to make clean-up of hair easy. The Razor Pet model also includes a washable filter to help cut down on pet odor and dust. Although reviewers varied on how long between cleanings of the filter, they all agreed that the process was easy and quick. 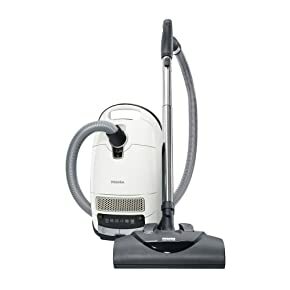 The cord is long enough to cover more than one room, and the model features a low-profile swiveling head that helps it get under and around furniture for effective sweeping. Rollers can get wound up with hair, but this machine was cited as having very easy removal and cleaning of all parts. May not last as long as some other machines. Rollers can become wrapped up with hair. Those with allergies will need to touch dirty filters to remove and clean them. The Miele New Complete C3 Cat & Dog Canister Vacuum easily tops the price range of our reviewed machines. retailing at just under $900. For that kind of price, you’d expect the Rolls Royce of vacuums – and the Miele certainly does have outstanding features. If you have a carpeted home and a lot of different rug or surface types, this machine will give both flexibility and a deep-down clean. There are SIX adjustable speed settings for different flooring types, as well as a five-level height adjustment. Everything from hardwood floors to high-pile carpet can be adjusted for from a foot switch. The C3 features extremely powerful suction, due to its 1200 watt motor. Reviewers praise its ability to pick up everything from sand to hair while being incredibly versatile throughout the home. The canister is easy to maneuver throughout the home, while the attachments allow you to effectively clean just about any kind of surface you come across – from wood floors to throw rugs to high or low-pile carpets. The attachments on the Cat and Dog model consist of a Parquet Twister Brush with 180 degrees of rotation for hard floors, a dusting brush, a crevice tool, and a powered Mini Turbo Brush designed for removing pet hair from upholstery. These can snap on to the stainless steel telescoping rod for a reach of 10 feet. The cord is a generous 18 feet long, and it also features a carbon air filter for maximum odor control. Users say it is easy to use, quiet and is built to last for decades, not years. At almost $900, the Miele is an investment. The roller brush cannot be removed for cleaning of hair, thread, etc. 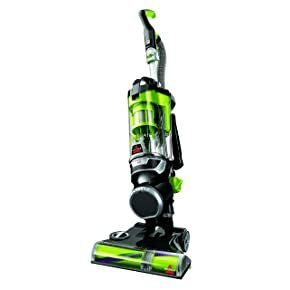 If you’ve spent more time crouched over the vacuum head with a pair of scissors than actually vacuuming, then check out the Bissell 1650A model. Bissell’s Tangle Free Brush Roll promises to make your life easier. 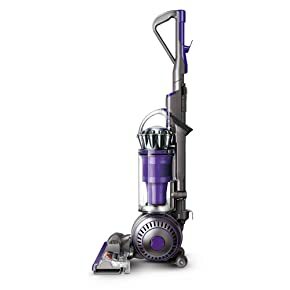 This is a canister model vacuum with easy emptying and an exclusive Cyclonic Pet Hair Spooling System that pulls pet and human hair away from the dirt in the basket, making for easier emptying. The Pet Hair Eraser is equipped with special tools to make removing pet hair easier all around your home. A 2-in-1 Pet Brush has rubber fingers to help lift up hair while the soft dusting brush takes care of anything delicate. Reviewers really loved the crevice tool – it has a nice feature in the LED light that helps you locate stray dirt in tight places. And, the powered TurboEraser Tool helps power out hair and debris from upholstery, stairs and throw rugs. For straightforward vacuuming, reviewers love the maneuverability and wide sweep that the 1650A offers. The suction is more than adequate, and the 1.5-liter canister is easy to empty. The cord is one of the longest in our reviews, at 30 feet. The unit includes a SmartSeal system to reduce allergens and odors. The unit adjusts easily from hard floors to various carpet heights from the power head. Reviewers agreed it does a good job on all sorts of pet-related debris – from bird seed to cat litter. The extension wand is not rigid and may be hard to use at ranges of more than 4 feet or so. Some reviewers noted the need to watch for hair building up at the ends of the rollers. This model is currently available in only one color – a bright, almost fluorescent green. This might be a dealbreaker for some buyers. The Shark Rotator Professional combines all the features of other upright pet vacuums with the ability to be more portable. This model has a “Lift Away” design feature that people with multi-story floor plans will really appreciate. A button located on the canister allows the user to remove and carry it to use as a portable, or to clip it back on to use as a standard upright vacuum. If you have a lot of stairs, or just need to reach into small spaces like closets, the portability of this model is a plus. The model also includes an array of accessories that reviewers liked. The portability aspect, along with the turbo power brush, made cleaning up upholstery and pet beds easy. The crevice tool is essential for getting into upholstery seams and tight spots, and the brush tool works on more delicate and irregular shapes like light fixtures. The floor brush is lighted and this is a favorite feature among reviewers. It does make a difference in finding and vacuuming up various debris on darker surfaces. It also swivels, which makes getting under and around furniture much easier. The dust cup is large and allows you to get through a lot of cleaning before needing to empty it. Reviewers mentioned the fine job that the HEPA filtering system did in reducing pet odors and in leaving the air smelling fresh after the vacuuming chore was completed. The suction is powerful and works well on both carpet and hard floors. Some reviewers have mentioned the replacement cost of the filters, which do need to be replaced regularly. This is one of the heavier units reviewed, at almost 20 pounds. Reviewers have commented that the entire unit is hard to handle and steer. 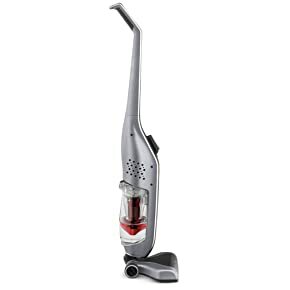 If you’ve been considering the ease of using a stick vacuum, the Hoover Linx is definitely one to consider. To go along with the other advantages of this style, this model is cordless and rechargeable. It also works well on carpet and rugs, unlike some other stick vacuums. Hoover has added a motorized brush roll and their powerful Windtunnel technology to ensure that this model can be used all around the house. The Linx is light and maneuverable, and the lithium-ion battery provides up to 40 minutes or so of vacuuming. It does take time to recharge, and some reviewers with larger homes have gotten around this issue by purchasing additional batteries. That said, it provides great suction and it doesn’t fade as the battery runs down. The dirt collector is large and easy to empty, per reviewers. It has settings for both hard floors and carpet, with many reviewers mentioning that it performed especially well on hard floors. The Linx has no additional hoses or attachments. The handle construction allows it to lay down at a steep angle – this is helpful for reaching under furniture or cabinets. The lighter weight makes it easy to maneuver. It’s easy to store, and a great unit for quick cleanups – there’s no outlets to search for, no cord to wrangle, and it’s easy to carry from one end of the house to another. No attachments. If you do a lot of upholstery cleaning or need to reach out-of-the-way spots, this is not a good choice. Battery life. If your vacuuming clean ups only take a half hour or so, you’re in luck. The durability of the roller unit is an issue that has been mentioned by some reviewers. 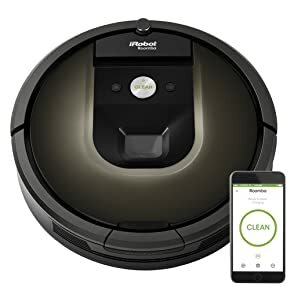 Don’t get us wrong – the iRobot Roomba is a solid machine – but the latest touches of technology are sure to please the gadget lover in you, as well. The 980 model is ready to plug into your Smart home technology. The unit connects seamless to your home WiFi and gives you a whole array of extra features. Did you ever wish you could add more customized cleaning to your cleaning bot? The 980 comes with Enhanced iRobot HOME App that you can use with your smartphone. You can schedule times, direct it to clean high traffic areas more often, do extra passes, and check to see where it’s been working, in case you forgot. Sensors on the unit detect where extra dirt is located, and the 980 automatically adds more cleaning power when it works on those areas. It also adjusts automatically for surface height. for homes with multiple surfaces, it handles carpet and hard floors differently. Power Boost mode will automatically increase the air power to efficiently clean any embedded dirt or hair on rugs and carpets. Reviewers love that the 980 can handle different room configurations, and be programmed to deal with any problem areas. They also complement the easy use of the bin design when emptying the unit. The 980 handles dog hair and dirt efficiently, and reviewers also like that it can be programmed to return to the charging base when it’s full. The Roomba 980 comes with a lot of features, and like any advanced technology, it’s not cheap. Reviewers mention that the Roomba performs poorly or not at all on black floors or carpeting. The cleaning power of this unit means that it can be noisy – it’s something you want to run while you’re away from home. Dyson vacuums are known for their suction power, and the Animal 2 is certainly no weakling in the product line. 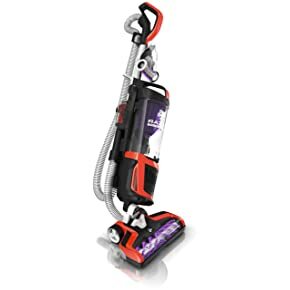 If you need reach and the ability to vacuum up almost anything, this unit is a great choice. 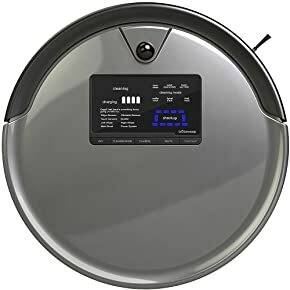 Since this is a pet vacuum model, there are some special features and attachments to address the particular needs of animal owners. One of the features that reviewers consistently compliment the Animal on is the type and length of the extension wand. This is located permanently on the unit and is stored within the hose. It can be pulled out and extended with a couple of clicks. The wand provides a convenient and non-flexible length for pushing into corners and up into areas around the ceiling. Any of the attachments can also be used on the wand. The Animal’s range of attachments includes a crevice tool for tight and narrow spots, a Tangle-free Turbine tool, stair tool, combination tool with a brush. The turbine tool is mean for upholstered items and items like lighter rugs that might be sucked up when using the cleaner head. The cleaner head itself is self-adjusting and turns the beaters off when on hard floors. Reviewers praised the strong suction and the ability to clean along floorboards. The dustbin is emptied with a button and holds just over half a gallon. There are 3 filters for effective dust and odor control – these can all be washed and air dried. The canister is clear and lets you know when it’s time to empty it. Even with the company’s fame for never losing suction, you’ll still need to do this frequently. The cord is one of the longest in our reviews – measuring at 35 feet. The Dyson also comes with a 5-year warranty. This is a heavy unit with a big motor. weighing in at almost 18 pounds. It’s not the best for lugging up and down stairs. The long cord does not retract and must be stored on the unit by wrapping. The wand mechanism can be fussy to reinsert when the user is done with it. Not every buyer is looking for a robotic wonder machine. Instead, they might prefer the more traditional canister vacuum style with some updates. The Elite 21814 is a perfect blend of old and new. The manufacturer has been making a version of this style successfully for years, and the pet version has strong suction and special tools to meet the demands of animal owners. 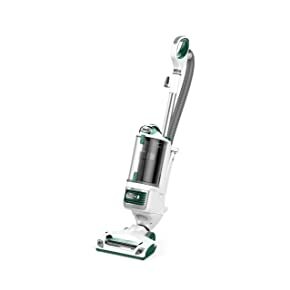 This is a substantial machine that divides its 29-pound weight between the powerful sweeping head and the canister. Dirt and hair are collected in disposable bags that are larger than some containers on other upright vacuums. Reviewers say that the disposal and changing of the bags are easy and tidy. The suction power is great. The canister has a two-motor system that really delivers and takes care of pet hair, per reviewers. A telescoping wand has good reach and is metal – release of the wand is done with a floor switch. Suction is adjustable, and it reaches well under furniture and up to the ceiling for cobwebs. The wand attachments include a bare floor nozzle, crevice tool and powered brush for furniture and carpeted stairs, and a handy fan cleaning tool. The power head also has a headlight – a popular feature for anyone sweeping debris off dark carpets. The Elite uses multiple HEPA filtrations to deal with allergens, dust and pet odors. Reviewers like the replacement bag prices and also the ease of cleaning the soft cloth filter. This unit may feel a little different when you’re first using it – the canister will roll along behind you while you push along the power head. It’s a bit of an adjustment – but if you’ve always had canister vacuums, you’ll find it to be easily manageable. Some reviewers were put off by the sound of the vacuum, describing a high pitched whine. If you need to pick up the whole unit to go up and down stairs, keep in mind that this is one of the heaviest reviewed. Some reviewers have noted issues with plastic parts breaking on the unit. The bObsweep is the only unit reviewed that also mops and sterilizes – making it a fine choice for a busy apartment dweller. It’s a robotic vacuum that has less technology than the Roomba – but also comes in at a lower price point. The PetHair Plus model comes with some very well thought-out features that reviewers liked. The dust collection bin is a generous 1 liter in size, requiring less-frequent emptying. The suction is very good – many reviewers mention that it copes with multiple pets and their hair. The vacuum has a friendly user interface and will communicate in sentences when there is a maintenance issue. As a robotic vacuum, it can be taught to obey boundaries and clean within certain areas. It will sense steps and turn back, and return to its base for recharging, or when its full. This model also has a mopping and UV sterilizing feature that works to keep things clean on a daily basis. The mopping feature uses washable and reusable pads – simply wet the microfiber pad with water or cleaning solution, and send the unit off. The bObsweep also has a UV light on the bottom of the unit that can be used to sterilize surfaces as it goes over them. Reviewers really love the company’s customer service and their responsiveness to any issues a new owner might experience with the unit. The vacuum can be programmed or also operated using the remote that comes with the unit. It understands the type of surface it’s on – increasing suction and decreasing speed on the carpet, for example. It can also detect when it’s crossing room thresholds or floor transitions and increase power to move over them. We think the bObsweep would make a nice roommate for a busy household. Mopping function is basic and meant for lighter, more frequent cleaning. Some reviewers have noted that the unit seems loud when running. Programming the unit will take a little time and study. Q: My cats hate the sound of the vacuum cleaner and hide from it. Is there a type of machine that would be less scary? A: Lightweight vacuums tend to be a little less noisy. Or, consider a robotic vacuum – pets seem to view them more as interesting toys than scary monsters. Q: We have cats, birds, and dogs - and the dust and hair go everywhere. What should I look for? A: Definitely get a vacuum with a good extension wand for reaching high above and into small awkward spaces. Q: I’m worried about energy consumption. What type of vacuum uses less electricity? A: Robotic vacuums are efficient and can actually save you money in the long run. Check with the manufacturer for their ratings. Pet owners need vacuums with specialized features for the most effective clean. Machines geared towards these customers have consistently focused on suction power, specialized attachments to deal with things like pet hair on upholstery, the ability to avoid tangles on the rolling beater brushes, large dustbins to handle lots of pet hair and debris, and effective air filtration to reduce odors, dust and allergens while cleaning. Your needs beyond this will help your decision on the best style of pet vacuum. Lifestyle, budget, floor plan and other factors can all indicate your best choice – whether it be for a lightweight unit that can be used on multiple floors, for a unit that needs to last for years, or simply one that you can program and forget. Our reviews should help you compare your options, and choose the best unit for you and your furry household members.